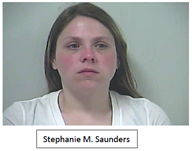 On Wednesday, May 11, 2016, Stephanie M. Saunders, 33, of the 17000 block of Connie Hall Road, was arrested and charged with five counts of Cruelty to Animals, five counts of Inadequate Care of Animals, and one count of Sale of an Unweaned animal. Ms. Saunders is currently incarcerated at Pamunkey Regional Jail with a $3500 bond. The Hanover County Sheriff’s Office, on behalf of Hanover Animal Control, would like to extend its sincere appreciation to the public for the generous donations to the Hanover County Animal Shelter. These donations will contribute to the overall care and wellbeing of the 68 dogs rescued during the course of this investigation.